The All-New Audi Q8 combines the elegance of a four-door luxury coupé with the practical versatility of a large SUV. 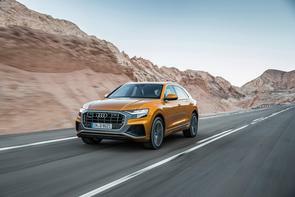 Fully equipped, comprehensively connected and tough enough for off-road duty, the Audi Q8 is a confident companion for both business and leisure. The new luxury flagship in the Q range which will feature S Line as standard, is set to launch in the Irish market in the third quarter of 2018. The Audi Q8 exudes sporty dynamics and upscale prestige like no other SUV from the premium car maker. At 4.9 metres long, 2 metres wide and 1.7 metres tall, the SUV coupé is wider, shorter and lower than its Q7 sister model. With a wheelbase of nearly 3 metres, it offers a spacious interior that beats off its direct competitors in most relevant dimensions, including interior length and headroom. There is a three-seat system in the rear which can be adjusted upon request. With the seatbacks folded down, the luggage compartment under the power rear hatch holds up to 1,755 litres.